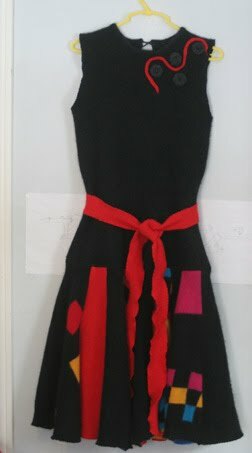 Here's a dress I designed for a customer from one of my markets. 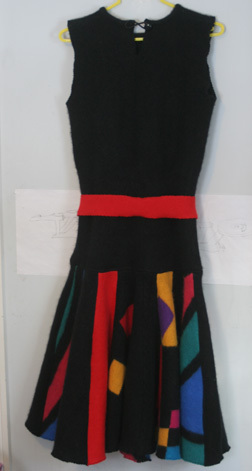 She's bought dresses made from repurposed sweaters before, and told me to design what I thought would work well. 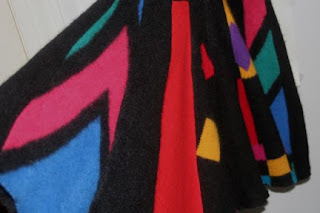 When I found the two sweaters that make up the brightly colored panels of the skirt, I knew I was onto something. Next to each other I would never have thought of them in one skirt - but then I looked at what Rebecca said: to use royal blue, teal, yellow - and realized that between the two sweaters, we had all those colors. Pretty wild prints, no? My girls say it looks "So '90's"! Hopefully Rebecca likes retro. 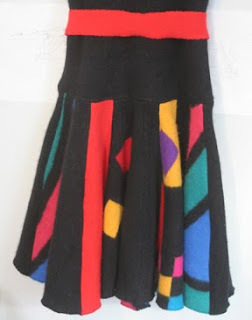 This was a great experience for me, as I've not made a dress from the sweaters before. The real test will be to see if Rebecca likes it!